Translated by Raman Michael from the book Aturayi w-tre plashi tiwilayeh (Assyrians and Two World Wars), by Yacoub Bar Malik Ismael of Upper Tyar; published by Sita Sapreta d-Alaymi Aturayi (Assyrian Students' Literary Committee); Tehran, 1964. An account of the invitation of His Holiness the Patriarch Mar Binyamin by Ismael Agha (Simku) in the town of Kuhnashahir, in the district of Salamast, for the union and alliance of Assyrians with the Kurds. This historical account and the murder of the Patriarch Mar Binyamin was told by the late Rab-Trimma (commander of two hundred) Daniel D-Malik Ismael of Upper Tyari, who was the personal bodyguard of the Patriarch. He was with the Patriarch and was the commander and supervisor of the company of riders who went down to Diliman. The Patriarch was in the city of Urmia, debating in the Central Assyrian Council as to the answer to be given to Ismael Agha, for his proposal, i.e. 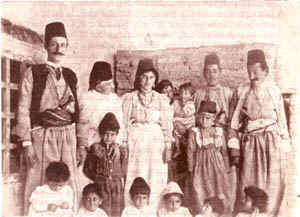 the union of Assyrians with the Kurds. At that time the Council decided and asked His Holiness that it was very important to unite with the Kurds. Because after this union, "we can keep ourselves safe against the attacks of the Iranian Government and that of Turkey", so they thought. For this ambassadorship, Shmoel Khan the son of Beijan, from the village of Mawana, with Ishey his brother, and a group of riders were selected. They were carrying His Holiness Patriarch's letter for the meeting of Ismael Agha in the village of Charah. Shmoel Khan was picked for this ambassadorship because he had an old friendship with the previously mentioned Agha. Shmoel Khan returned from his ambassadorship and said to His Holiness that he would be welcomed with great honor, and happiness with sympathetic pleasantries. These words he spoke in front of the whole Council, and he spoke of other formal things with His Holiness, which we did not know. What Shmoel Khan spoke with the Patriarch, affected His Holiness more, and he accepted the meeting with Ismael Agha. After the return of Mar Shimon Binyamin from Urmia to Salamast, on Friday March 2nd, in the Afternoon, His Holiness received a letter from the Governor of the town of Diliman, inviting him for dinner on Saturday, to calm the small skirmishes in the land, and moreso to hold a personal discussion. Then His Holiness asked Rab-Trimma Daniel to make ready 100 armed riders for Saturday at seven in the morning for the next day. At seven o'clock, I Daniel, called His Holiness and said "My lord, the riders are ready as you asked". At eight o'clock in the morning, His Holiness' carriage left. In the carriage, sitting with His Holiness were, Rab-Khaila (General) Dawid, his brother, and Palkonik Qondrato. I divided the riders into two companies, I took 50 with me in the front of the carriage, and 50 in the rear of the carriage. We neared about 100 meters to the city gate, and there I stopped the riders. I myself rode my horse until I reached the commander of the guards guarding the gate. I asked him and said "have you been contacted by your government regarding the arrival of Mar Shimon and his meeting with the Governor of the city? ", he answered, "yes, please go in". Then I returned to where I had halted the riders, and commanded ten of them to stay with the Iranian guards guarding the gate, so they would be attentive to any incidences that might occur. We were entering the gate when the commander of the Iranian guards said that it was not necessary to leave our guards there. I answered on your behalf, "you are right, but it is necessary for us that they remain here", and on every corner I put guards from our own riders, until we reached the gate of the courtyard of the Governor's building. When His Holiness' carriage arrived, I saw the Governor and with him a group of town leaders who came out to welcome His Holiness the Patriarch. They took him inside with due respect, and went upstairs to the meeting room. The remainder of the riders I placed in front of the courtyard and took five soldiers with me. We went upstairs in front of the meeting room, to see who or what was there. I saw a Yuzbashi Rab-Imma (commander of one hundred) sitting on a couch in front of the courtroom, and with him Onbashi Rab-Isra (commander of ten) and five soldiers. We greeted them and we sat on the other couch in front of them. Both sides were quiet and calm and did not speak to each other for a quarter of an hour. I observed that both parties were ready with holsters filled with bullets. Then I got up and listened to the door of the meeting room, because I was filled with worries. I wasn't hearing any talking, then I stood back for a while, and then for a second time I went to listen, and I didn't hear any talking from inside. Then I thought that maybe the Iranians had conspired against the Patriarch without our knowledge. Then I told one of the soldiers to go outside and get me a letter for the purpose of going inside. The soldier came back and gave me the letter, I got up and told the Yuzbashi that I needed to deliver this letter from Commandant Kozmin Commander of the Urmian Army, in a hurry to His Holiness. Then the Yuzbashi told me that I don't have permission to go inside. Then I was certain that what I was thinking was right, and this is the reason why he is not letting me in to see His Holiness the Patriarch. For the second time I stood up and walked a step forward and said "I'm going in", and he replied "you don't have permission, don't go in", and he stood up on his feet and took a step forward, at that time I threw my rifle from my right to my left and pointed it at the chest of the Yuzbashi and pushed him back, and both sides got up and I drew my gun and put it in his chest, and told them, "don't move or we will engage now! ", they stood frozen and did not dare to make a move. I opened the door and went inside and did not find anybody, then my sight darkened and I did not know what to do. My thoughts were confused, looking all around the meeting room, I saw there was a door on the Eastern side. I thought it was closed but with the laying of my hand on it, it opened, and I saw His Holiness sitting in the middle of the room eating lunch. A room very clean, beautiful, and nicely decorated, with a fine table, filled with various foods. Then, just like when you remove the fire from under something which is boiling and the steam settles, I also like this relaxed and became calm. My heart became joyful, and my thoughts calmed from that movement which was thrashing me about. I gave the letter to His Holiness and said that I was very sorry for my entrance here without the proper procedures, but I listened and did not hear any talking and became very worried and needed to know what was the situation. This letter is just an excuse to enter here. His Holiness, making it seem like he was reading the letter, looked at me and said, "Daniel, don't worry, those that I'm sitting with cannot do anything to us". I bid them peace and came out to the Yuzbashi, and they were all sitting calmly with their rifles in their hands without a sound. I also sat with them without saying anything. We awaited the Patriarch's exit, after three quarters of an hour, they came out of the dining room and into the living room, the Patriarch commanded me to get ready to return. His Holiness left the Iranian leaders and they escorted him to the rear courtyard, and he bid them peace and we started to the Patriarchate. I was remaining in the rear and collecting the guards that I had placed in different spots for safety and guardianship. We were on our way to Khusrabad, when it started to snow. When we reached the first road of Khusrabad, there we saw a rider of the area, who used to work for Ismael Agha, he used to be a Christian but now was a Moslem. He came in front of the carriage and stopped it, he gave a letter to His Holiness the Patriarch. His Holiness got the letter read and said to this messenger, "Good, you go and when we get home we will answer Ismael Agha". His Holiness immediately called the Central Council of Salamast, who were ready at that time. They joined in on this Council with Palkonik Qondrato the Russian, Captain Gracy the British, and Lieutenant McDowell the American. His Holiness read the letter to the Council and said, "we are being invited to go up to the town of Kuhnashahir to personally meet to discuss what we spoke of before hand with the ambassadorship of Shmoel Khan." But, the majority of the Council did not recommend this, saying today is the start of the great fast and snow is coming, and if he's desperate to see His Holiness, then let him come here to see you. Mar Shimon replied and said, "you are right by there is only one problem remaining from these incidences, let us also finish this today, because he has come from afar and it won't take more than two hours". Then Captain Gracy and Lieutenant McDowell also agreed with His Holiness. In this hurried state they organized 150 riders with Palkonik Qondrato, four other Russian Officers, and Rab-Khaila Dawid, the brother of His Holiness, as Commander of those riders. We went up and arrived at Kuhnashahir and entered via the road of the Market. At the end of the road, we were commanded to stop by Rab-Khaila Dawid, who took with him six riders and went to see if there was a road for His Holiness' carriage, to that place that was suggested by Ismael Agha (Simku). After ten minutes from the time Rab-Khaila Dawid returned, saying that the road is good, we moved forward. We reached the gate of the courtyard and we saw the whole of Simku's army standing in two columns as is the military procedure, and himself standing in front about ten feet away. His Holiness' carriage stopped and Mar Shimon stepped down from the carriage. Simku came forward and bowed two times as is the Kurdish custom, and he greeted His Holiness with his hand on his chest. He took the hand of His Holiness and shook it, and fell behind His Holiness who was watching the columns of Ismael Agha's army, saying to the Agha, we are very pleased to see your army so organized. 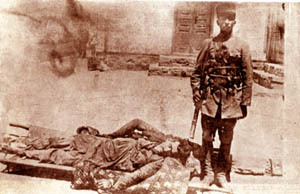 The first column had Russian rifles, and the second column had Turkish rifles. Then Simku again put his hand on his chest and bowed himself to His Holiness, he said "please enter inside", and we went inside the courtyard. Mar Shimon with Qondrato, Rab Khaila Dawid, Shmoel Khan, and four Russian Officers entered with Simku and his group into the meeting room. There they started with their discussion and we remained with the 150 riders in the courtyard, waiting for Mar Shimon to come out and to return to Khusrabad. We were thinking that His Holiness Mar Shimon would not be delayed more than half an hour. For this reason, the riders did not dismount from their horses, and their rifles were hanging from their sides. We saw that they were delayed more than what we were expecting. 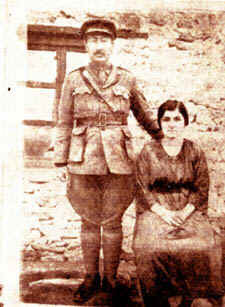 I called a brilliant fighter whose name was Jajji (Georges) from Lower Barwar who was very courageous and smart. I told him to go up to the conference room and see how many foreigners are there, and come back hurriedly and tell me. He came back and said that the meeting room is full, and the majority are Kurds, sitting on their knees and each one with his rifle in his lap. When I heard this I thought, "Oh Lord, then why weren't we made aware of this". I said to Jajji, "I will enter inside right now, you take seven men whom you think to be the bravest and most clever, send four of them inside with me, and three will stay with you in front. You should be on careful guard for every movement, which you will report to me in immediately". Then I went up to the porch in front of the meeting room, it was empty, not one person was there, I opened the door and went inside, and saw the meeting room full of men, and Mar Shimon was sitting at the head of the meeting. 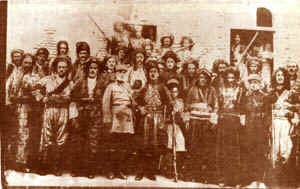 To his right was sitting Qondrato, Rab Khaila Dawid, Shmoel Khan, and those four Russian Officers, and to his left was sitting Simku and the Kurdish leaders. I closed the door and stood on my feet, because there was no room to sit. At that time, in came the four brave men that I had asked for, and they stood next to me. Then I saw one of those Shekaks (Kurd from the Shekak tribe of Simku) come inside and whisper something in Simku's ear and then leave. I knew that this was one of the commanders of his fighters, and that maybe there was something hidden here. I wanted to find an excuse to do something to counter this hidden message. Then I saw an Iranian serving tea to those Kurdish leaders and did not give any to the Russians. At the same time I said to the tea server, "why aren't you also serving the Russians, what is the reason, or perhaps they've never seen tea such as yours?". Then one of the Kurds that was sitting in the meeting answered, "Let the Russians drink kuradard (blindness poison)". With this I became positive that what I was thinking in my heart was true and I replied to the Kurd, "may you drink kuradard", with these words an old Kurd sitting ahead of him said, "be quiet you nuzzun (ignoramus)", which is an Assyrian word, and that's how he shut him up. But the words of that Kurd made my thoughts very sad, and for this I blamed myself, because I remembered also in Diliman these thoughts confused me, but they did not turn out to be true. Because of this I calmed my mind from this thought, and I did not do what I had planned to do. After that, I heard Simku say to Shmoel Khan, "Tell Mar Shimon Afandi that I have heard he speaks our Kurdish language very well, so it's not necessary to translate". This was translated by Shmoel Khan. His Holiness Mar Shimon replied, "It's true Agha, that I did speak your Kurdish language well, but since we left for a period of three years we haven't spoken it, because of this it is difficult for us to speak it". Simku replied, "If God succeeds, after this union you will speak this language like before". After a few minutes Simku said, "If you please, we have readied a different room for you, Qondrato, Shmoel Khan, and Mirza Agha". After they entered this room, what they spoke with each other, we didn't know. We went out to the courtyard waiting for His Holiness Mar Shimon, but we left the four soldiers, who came in with me in the meeting room. We waited about a half an hour, and they were still not done with their talk. I and Rab Khaila were standing in the courtyard, I saw a Kurd staring carefully at Rab Khaila Dawid. Each time he would go to his friends, and come back near us and stare minutely at Rab Khaila. I said to Rab Khaila, "The Kurd knows you, it seems from the way he's looking at you". Rab Khaila replied, "maybe he has seen me, because from what I remember, there was a Kurd who used to come from around Gawar to Qudshanis, to the trade house, he looks very much like him". I said, "don't you think there's something bad in this man's heart, from that whispering in Simku's ears?". Rab Khaila replied, "I don't think so, maybe they had some points they were reminding Ismael Agha". They were delayed in that room no more than one hour and a quarter, when His Holiness the Patriarch came out, being escorted by Simku with all honors, until they reached the inner courtyard, where they exchanged many pleasantries and thanked each other. Mar Shimon and those with him came out to where the riders were waiting, I mounted my horse and went near the carriage about twenty meters. The Patriarch laid his hand on the carriage, putting his foot on the footstep of the carriage, to go up into the carriage, when I heard the sound of a rifle exploding from the window of that room. Simku himself fired this shot at the rider of the carriage and killed him. This was the signal that was prepared by Simku. His Holiness saw that the driver was killed, he threw himself across the horses to the other side of the carriage and all at once from all sides they opened fire from their rifles from the roofs around us into the courtyard where we were standing. There occurred such a shocking confusion which was unexpected. 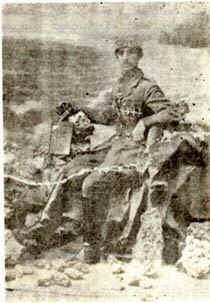 The sound of rifles was like thunder and the speeding bullets into those riders was like hail coming down from the sky. At that time I realized that I was thrown in the air and that I had fallen and was lying on the ground on my left arm. My horse which was about ten feet away from me had fallen and was killed. On the first round of fire my ears were not functioning from the sound of the bullets that were coming down in our faces. No matter how hard I was listening for the sound of rifles I was not hearing them because my ears were not working from the sound of the bullets whizzing by. I could only see with my eyes and my mind was also clear. I thought about what to do, I quickly got up but my left arm did not help me, I thought that I was wounded, but I picked up my rifle with my right arm. As soon as I took it in my hands it was destroyed by bullets. Then I thought that there was no chance of saving myself and that this was the last moment of life. Looking into the courtyard I saw corpses of dead noble warriors with their horses twisting in each other and soaked with blood. Then I thought even if my left arm is not helping me but with my right arm I would try all that could be done with all my strength until the last minute. In this poisonous and frightening situation I picked up a rifle of one soldier that was killed near me. From there my eyes fell upon the Patriarch who had not fallen yet and was going with some soldiers near a brook leaving the courtyard where on the other side of the brook there was not much danger remaining. I hurried to reach him, I came within about twenty yards, as I was looking at him as he neared the brook, suddenly he fell because most of them were firing at him to kill him. In a hurry I ran where he had fallen and thought that he had been wounded, though I was with one arm. At that time, in this situation of life and death, I would try to save his life. I reached him, hung my rifle round my neck, I bent over and raised him with my right arm onto my chest. But when I looked at him, he was weary and finished. It was not possible with one arm to put him on my back, especially in that flood of bullets. From there I jumped over the brook to the other side, and went about thirty yards down that road. I reached four Kurds that suddenly appeared in front of me, they opened fire in my chest and I in theirs, I saw one of them fall, and the others ran away. I jumped over the one who was killed and reached the beginning of the road. In one turn I looked behind me and saw those three men coming after me again quickly, and they fired three more shots at me, and I shot one at them and they fell behind. I went by that road under the town's market and there I also met up with a group of Iranians that numbered about twenty or more coming towards me. I saw that I had no chance except to drive ahead, I opened fire from my gun at them and I saw two of them fall and the others ran away. I dropped my empty gunpowder sack and picked up a full one and drove on through the corpses down that road. There was little hope for my life, I was waiting for the last minute when I would be dropped and my life would be over. But among all this trepidation and shock of fear, the Lord with his mercy He paced me, and I reached a place with which I was slightly familiar. Towards the end of the market square, there I stopped from my running, and I breathed a little, and became more comfortable. I was walking but my thoughts were still behind me thinking about His Holiness, and this evil atrocity that the cursed one committed. In these thoughts I reached the mill that was next to Kohnashahir, on the side of the road, going down to Khusruabad (Khusraba), there I sat down to rest from my weariness. But my body was numb and my mouth was dry and my lips tattered. Then I examined my arm and saw that it was not injured, but it was sprained from that fall I had fallen off of the horse onto those rocks in the courtyard. But all my clothes had holes in them from bullets, and also my hat. Nothing had touched my body, I became sure that I was all right. At the same time remembering all that weariness and fear in those corpses and horses killed and soaked in blood in the courtyard, and God with His mercy saved me. This is how I decided, I would either take out the body of His Holiness, or let me also die with all the others who were killed, because my life had no meaning left for me. 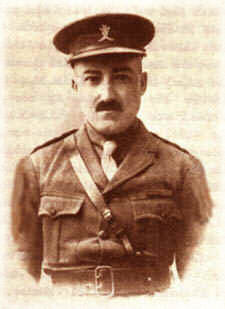 As I was mixed up in these thoughts, suddenly twenty Assyrian soldiers reached me from my own group, under the command of Rab Khamshi Khanania Talia. No matter how much they tried talking and crying out in a loud voice, I could not hear them, but only see their lips moving. Then I told them I cannot hear because my ears were not functioning. They started talking by signals to me, and I explained the situation as it was, I also said what was to be done. They spoke by signals saying, "you stay here and we will do everything that you commanded". I replied to them saying, "there's no sense in you going because you don't know where he is, I must come with you, we will either take out the body of Mar Shimon, if not, then let us all die". We divided into two groups, one from one side of the road, and one from the other side. I fell to the front by that road which I had come from. When we reached a Minaret that was held by Iranians, we were delayed for a long time there fighting. Until it became quite dark, slowly we passed that road very carefully and quietly. I reached the gate and saw people in the courtyard, they were searching the dead bodies and stripping whatever was valuable from them. I remained calm until all my friends reached me. On the sound of my rifle, they also opened fire on those that were stripping the dead corpses. Only one of them fell, who was the closest to the gate. The rest ran away into the inner courtyard. From the one who was felled we learned that those stripping the corpses were Iranian. It took us some time until we found the body of His Holiness, because they had furthered him from where he fell and they had also removed his official clothes. In a hurry we put him on the back of martyr Patto Kohnaya of Upper Tyari, later changed to Iskhaq Chado of the village of Chamba, and Odisho Toma of Halmon until we took him out of the town. There we surrendered him to Rab Khamshi (commander of fifty) Khanania Talya of the village of Chamba who had fifteen soldiers with him who took him to the village of Khusruabad.